Hey everyone! Hope you are all doing well! I'm back again with another Five on Friday! If you don't know what Five on Friday is, it's when you share five things that are on your mind. It can be about absolutely anything that you feel like sharing! Once you get your blog post up, you go to one of the links below, and join the link up. Just that easy! I hope some of my readers decide to join the link up! Last weekend I decided to pamper myself a little. That meant masking! I had some masks in my stash that I normally wouldn't reach for. 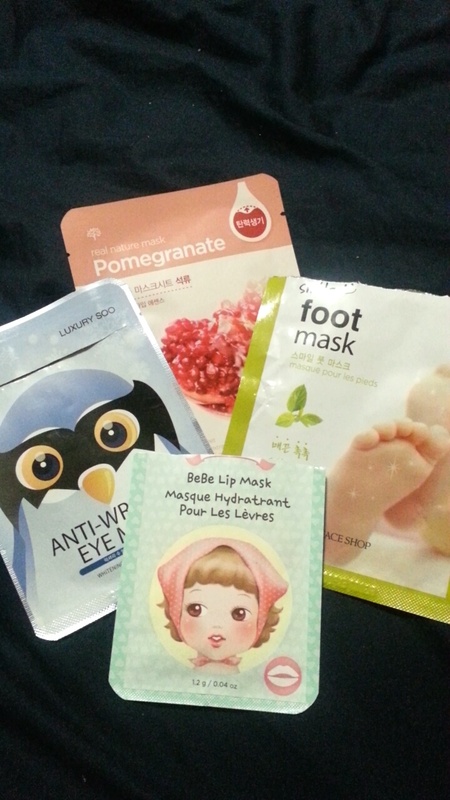 I ended up pulling out an anti-wrinkle eye mask, bebe lip mask, pomegranate face mask, and thefaceshop smile foot mask. I have to say that I thought the foot mask would be really awkward, and while it wasn't the most comfortable thing at first, I ended up really loving it! I didn't notice a difference with the lip or eye masks, but I noticed a difference with the foot mask, and I would recommend it to anyone. They were pretty much plastic booties that are filled with a thick cream and you stick your feet in them, and leave them on for about half an hour. They were very moisturizing and I will definitely purchase more in the future. This specific foot mask came in my advent calendar from TheFaceShop. You can see what I got in that calender here, here and here! Guys. 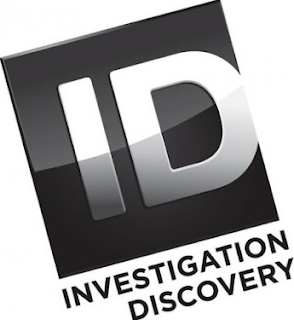 I think I'm obsessed with I.D network on TV. We don't watch cable here much because we watch shows/movies off of our Android box. I keep finding random shows that sound interesting and they all happen to be aired on the I.D network. I've become obsessed with "Forbidden, Dying for Love" and "I, Witness".. if you're into shows that are about murders basically, I recommend them! They're not scary at all, but follow real stories about people who have been murdered over being in love with someone their families don't approve of, or witnessing a murder and telling the story. Plus, both of these shows are fairly new, so there's not too many episodes to binge watch if you decide to check them out! 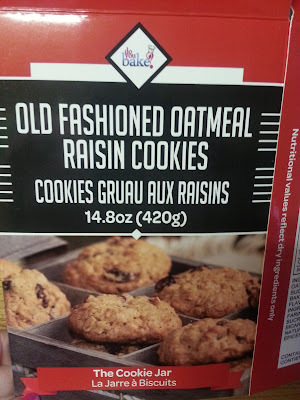 Along with pampering myself last weekend, I also made some oatmeal raisin cookies. I prefer making cookies from scratch, but found a box of these in my cupboard. They were super easy to make (just add eggs, water and butter) and they came out super delicious too. They also stayed soft and chewy for a few days, which is a thumbs up in my book. But they usually don't last longer than 3 days in this household! Are any of my readers unemployed at the moment? Can I just vent about how difficult it has been looking for a full time job? I've been unemployed for a few months now, and I've had no luck with anything. It's so discouraging, but I know I have to keep trying. My fingers are super crossed that something will work out soon . Since I've decided to somewhat be on a no-boy, or I should be realistic and say a low-buy, for as long as I can go.. I've decided I will start choosing a palette in my collection and use it for a month. As of now, I don't wear eyeshadow much because I'm only really out running errands, but I have some beautiful palettes that are just sitting in a drawer. 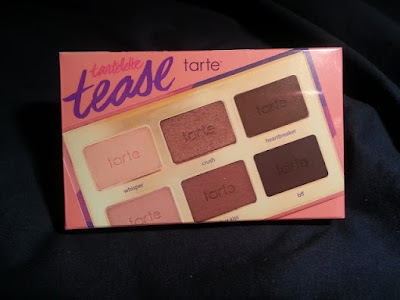 Picking a palette and using it exclusively for a month will force me to actually use it! I think I do well for skincare when it comes to empties, but I would really like to start using up more makeup. I've never heard of a foot mask!I don't watch the I.D. channel, but i will tune in for Dateline every once in a while, and it's always the husband. I'm sorry to hear you're having trouble finding a job,I hope you find sometsomething soon! Those masks sound great, I will have to try them! I love shows on ID too!